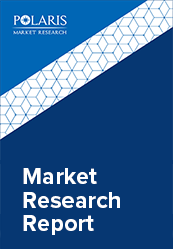 The global bio-based polymers market size was estimated to be worth USD 14.2 billion in 2018 and is anticipated to grow at a CAGR of 10% from 2019 to 2026. Bio-based polymers, in the present industry scenario have been witnessing similar growth patterns as that of the conventional polymers, owing to significantly rising demand for bio-diesel production. The global production capacity is projected to increase to approximately 8.5 million tons by 2021 from around 6.6 million tons in 2016. Annual production capacity of bio-based polymers was around 10% during 2012 to 2014, but the annual growth rate in 2015 to 2018 have been relatively slow i.e. only over 4.5%, but it is approximately similar to that of worldwide polymer capacity growth rate. The primary factors for the slow growth in the past two years is owing to a steady increase in crude oil prices, low regulatory support policies in several nations, and most importantly a much slower than projected increase of utilization capacity rate. But, the dynamics for every bio-based polymer are not the same and demand for many of them have been growing impressively. PHA a new polymer, bio-based drop in PET, and high-performance PA are some of the fastest growing products in the current industry scenario. France and Italy are the two most crucial markets that have played significant roles in driving demand for biodegradable solutions primarily in the packaging industry. Rising demand for biodegradable packaging products has been growing at double digit rates. Another crucial factor driving attention for these biodegradable polyamides is the rising issue of microplastic dumping (marine littering). Globally, its production was around 6.6 million tons and its projected to increase to 8.5 million tons by 2021. Among the overall bioplastics production, bio-based and non-biodegradable polymers dominates the yearly production ratios. PUR ad PET constituted around 70% of total bio-polymer production and this trend is expected to continue over the forecast period. The recent dynamic expansion is seen for bio-based polyhydroxyalkanoates (PHA), that is big family of different polymers. But its production is still less compared to the other polymers and is anticipated to triple by 2021. 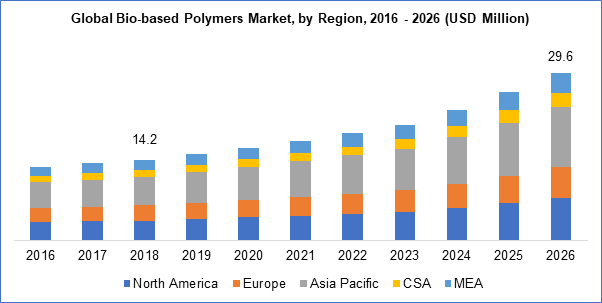 Polyamides production was witnessed to achieve the second highest growth rate and is expected to double over the next few years. PLA and PET demand grew by approximately 10% in the last three years. There are over 20 bio-polymers and each one of it have a different market dynamic. The bio-based epoxies including PET, CA and PUR have the largest production capacities and also have a well-established market in comparison to other bio-based polymers. The aliphatic polycarbonates are big family of polymers, but most of the bio-based APC are still in a nascent stage of development. DURABIO of Mitsubishi is the most known APC. It has several applications in automotive interior parts and screens as it offers enhanced optical characteristics and high transparency. Cellulose acetate (CA) is considered only 50% bio-based. Its demand is similar to that of the epoxies, and is used in cigarette filters and frames for glasses. The epoxies are around 30% bio-originated that are made out of bio-based epichlorohydrin. Production capacities for epoxies are anticipated to remain stagnant and slow growth is expected till 2021. EPDM is produced from bio-based ethylene and is 50 to 70 % bio derived. Lanxess, a specialty chemicals company manufactures ethylene propylene diene monomer rubber at its plant in Brazil and is the sole highest producer in the world. Application segments are comparatively low; however, these are expected to increase over the forecast period. Bio-polyamides are an enormous family which explains the wide-range of bio-based carbon content These are sebacic acids produced from castor oils. Evonik, has recently developed a polyamide derived from palm kernel oil. Arkema is currently the largest manufacturers of bio-based polyamides. Poly (butylene adipate-co-terephthalate) (PBAT) are produced from 1,4-butanediol (1,4-BDO), terephthalic acid (TPA) and adipic acid (AA). These are only 50% bio-based. Its use for commercial means has not yet started and is still under research phase. BASF was the sole formulator of bio PBAT but Jinhui Zhaolong High Technology entered the market in 2014 and has been offering strong competition. Polybutylene succinate (PBS), produced from 1,4-BDO, succinic acid and often with in combination with a third monomer. Asia is the leading producer of the product and in 2017, PTT MCC Biochem established a new facility in Thailand for additional production. Starch blends are considered completely biodegradable. These polymers are from twenty-five to hundred percent bio-based. Italy based Novamont is currently the largest producer of starch blends. Global production is expected to be on a steady pace. Roquette, one of the leading producers of starch blends stopped its production in 2015 owing to low oil prices and also due to delay in implementation of a favorable legislative framework. France, became of its attractive market space globally in 2017 owing to its increase in application segments. Asia Pacific was the largest consumer in 2017. From the past three years, most of the investments for bio-based polymer new capacity additions have been witnessed in the maximum in Asia Pacific region. Several factors that are driving investments in the region include the region’s better and easy access to feedstock, and most importantly its favorable regulatory policies. Owing to complexities in manufacturing value chain structures of cellulose acetate and epoxies the reparations vary completely in different regions. North America and Europe’s share are expected to remain almost stable from 23.5% to 22.6% and 27.2% to 26.1% respectively. Asia Pacific region is anticipated to increase from 43.5% to 47%. The South American region consumption in projected to be around 4.5% by 2026. The bio based polymer market is concentrated and is driven by the leading chemical companies. However, several small-scale manufacturers have come up in the past five years and are offering serious competition to the MNCs. Some of the leading industry participants include BASF, AkzoNobel, Evonik, and Cargill.